Humans, mice, narwhals — most mammals rely on ancient genes to produce teeth and tusks. But the tuskless elephants of Africa show that nature can quickly alter the code. “GORONGOSA NATIONAL PARK, Mozambique — We are flying in a Bat Hawk aircraft — which may be named for a raptor that preys on bats but looks more like a giant, lime-green dragonfly — and my hair, thanks to the open cockpit, has gone full Phyllis Diller. Scudding above flood plains the color of worn pool table felt and mud flats split like jigsaw puzzles, we dip toward the treetops and see herds of waterbuck scatter with an impatient flash of their bull’s-eye rumps. We are searching for the elusive tuskless elephants of Gorongosa, elephants that naturally lack the magnificent ivory staffs all too tragically coveted by wealthy collectors worldwide. 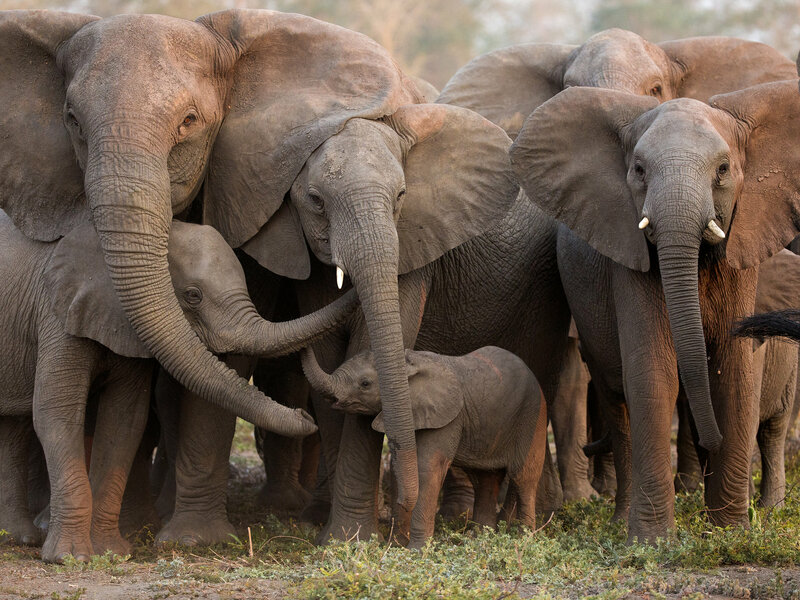 Tuskless elephants can be found in small numbers throughout Africa, but Gorongosa is known to harbor a sizable population of them, the legacy of a violent 15-year civil war. Tusked elephants were slaughtered for their ivory at a harrowing rate, and the park’s rare tusk-free residents thus gained a sudden Darwinian advantage. Today, about a quarter of the park’s 700 or so elephants are tuskless, all of them female, and I am determined to catch a glimpse of at least one. Yet a week of ground searches has proved fruitless, and now we are circling in a plane and still nothing and, holy mother of Horton, how can such massive creatures go missing? “There!” Alfredo Matavele, the pilot, cries triumphantly, pointing toward a cluster of trees. “And there!” pointing toward a watering hole. And there and there. “Do you see them?” he demands. Oh yes, I see them. Dozens, scores, cliques and claques of elephants, ears flapping like flags, trunks slowly swinging, and many of their faces decidedly free of ivory eruptions. I have found them at last, my sisters in dental deprivation. Other people may admire elephants for their brains or their complex social lives; I feel a bond with this mutant crew. After all, I’ve learned that we share a basic developmental anomaly, which may well be traceable to the same underlying glitches in our DNA. Elephant tusks happen to be overgrown versions of the upper lateral incisors — the teeth right next to the front teeth, before you get to the canines. Simply put, tuskless elephants lack lateral incisors. I, too, lack lateral incisors; moreover, the trait runs in families. Tuskless elephants often have tuskless kin. Both my daughter and my younger brother are missing their lateral incisors. No wonder we’ve always had trouble ripping the bark off trees. Scientists do not yet know the precise cause of tusklessness, but they’ve made great progress in deciphering the genetic program behind mammalian tooth development generally. It turns out to be an old and widely shared code. “Tooth development has been very conserved during evolution,” said Irma Thesleff, a developmental biologist at the University of Helsinki in Finland. She has found that mutations associated with tooth abnormalities in mice also show up in genetic studies of people with missing or malformed teeth. “Elephants are no more different from humans than mice are,” Dr. Thesleff said, “so it’s quite possible that the same gene or genes are involved” in elephant tusklessness and human toothlessness. For example, it could be a typographical error in the genetic code for a signaling molecule called wnt10a. “This is one of the most commonly mutated genes in humans with missing teeth,” Dr. Thesleff said. And oh, we gap-mouths are everywhere. An estimated 8 percent of the population is missing one or more of the 32 teeth found in the standard adult set, and that figure rises to about 30 percent if you include a natural absence of the four extra wisdom teeth that many people get yanked out anyway. Missing lateral incisors is thought to be the second most common form of so-called tooth agenesis. One archaeological study of a 9,000-year-old farming community in Basta, Jordan, found that 36 percent of the inhabitants lacked lateral incisors. Researchers viewed the elevated rate as evidence of inbreeding. The normal background rate of the condition is more like 2 percent to 4 percent, which, coincidentally or otherwise, is close to the background rate of tusklessness among African elephants. Even more common in humans than a lack of lateral incisors, said Ariadne Letra, an associate professor at the University of Texas School of Dentistry at Houston, is the absence of the lower second premolars, the teeth with two cusps located in the bottom jaw just before the four-cusped molars. Through animal studies, scientists have learned that teeth can grow in macabre isolation from other body systems, as though they yearned for a career as novelty dentures at a Halloween party. Isaac Salazar-Ciudad, a theoretical biologist who studies tooth development at the University of Helsinki, explained that if you remove part of the primordial mouth of a mouse embryo and culture it in a dish, it will develop an array of normal-looking mouse teeth. Although the basic genetic program is widely shared, tooth building is also flexible, susceptible to evolutionary influences. Teeth develop through the interaction of two types of embryonic tissue, epithelial and mesenchymal, which early in gestation — by about Day 28 in humans — start folding up into each other origami-style to form a series of large and small buds. Those buds can then be sharpened into canines or incisors for slicing into flesh, or flattened and sculpted into molars with any number of cusps for processing high-fiber plants. The core of a tooth, the pulp, holds the blood vessels and nerve fibers, while the bulk consists of a bone-like material called dentin. The outer coating of calcium phosphate enamel is the hardest substance in the body, which is why animal teeth account for a disproportionate share of the fossil record. And when lengthened into structures that breach the boundary of the mouth and grow throughout life, teeth become tusks — for digging, fighting, hauling, piercing, threat display. In most cases, tusks are recast canines, curving to the side and upward in wild boars and warthogs, or drooping down in walruses like Yosemite Sam’s mustache. In narwhals, the unicorns of the Arctic, the tusk is built of a single overgrown canine that penetrates through the narwhal’s left upper lip in a permanent open wound, which ends up hosting tiny shrimplike creatures with an appetite for shed whale skin. The narwhal tusk “is the only straight tusk in nature, and the only spiral tusk, too,” said Martin Thomas Nweeia, a narwhal expert who lectures at the Harvard School of Dental Medicine. Tusks, as a rule, are multipurpose devices. Boars and warthogs apply theirs offensively and defensively, to battle one another during mating season and to gore predators many times their size. Walruses use their tusks like grappling hooks, to haul themselves out of the water and onto the ice, and as weapons against polar bears and in sexual contests — but not, as commonly believed, to forage for food or pry open oysters. The purpose of the narwhal’s tusk remains a subject of contention. Some researchers suggest the whales use it to stun their fish prey. Dr. Nweeia and his co-workers propose that it is a kind of sensory organ, for detecting changes in water salinity and temperature. Elephants are the true masters of the Swiss Army tusk. They use their mighty incisors to dig for salts and minerals, to break off branches and get at the foliage, to pry into trees and peel off the bark — “They really love to to eat bark,” said Joyce Poole, scientific director of Elephant Voices, a research and advocacy group working at Gorongosa — to scoop an errant calf out of a mudhole or lift a sleeping one to its feet. They coordinate tusks, trunks and feet to de-thorn acacia trees and soften tough grasses, and they stash leafy branches across their ivory shelves for later consumption. Just as people are left- or right-handed, so elephants have a favored tusk. “If they’re going to break a branch over a tusk, they use the same tusk repeatedly,” Dr. Poole said. A groove forms in the preferred tusk over time. But it can take two tusks to tangle. From my perch in the Bat Hawk, I watched a pair of large bull elephants spar by locking together their massive tusks, which can weigh well over 100 pounds each — seven times the weight of an average female tusk. Yet the biophysical properties that make tusks such splendid tools to own have all too often proved their owners’ undoing. People have long coveted ivory for its beauty, ductility and presumed magical properties. The first appearance of narwhal tusks in medieval Europe is thought to have given rise to the myth of the unicorn, and to a mad surge in demand for the nine-foot spiraling spears. Elizabeth I is said to have paid 10,000 pounds for a narwhal tusk, then the price of an average castle. The drive to harvest walrus ivory may well have contributed to the settlement of Greenland in the 10th century, and led to the near extinction of walrus populations around Norway, Iceland and other parts of the North Atlantic. Elephant ivory, however, is considered the finest in the world, and elephants have long been slaughtered to supply it. Despite international efforts to ban the ivory trade, demand still drives a business worth at least a billion dollars a year. The persistence of elephant poaching has prompted researchers to wonder whether elephants really needed their tusks, and whether they might not be better off if the tuskless trait were to spread more widely through the African population. Shane Campbell-Staton, an assistant professor of ecology and evolutionary biology at the University of California, Los Angeles, and his colleagues have begun systematically comparing tusked and tuskless elephants in Gorongosa, seeking not only to identify the genes involved in tusklessness but also to solve perplexing patterns of inheritance. Why, for example, are nearly all the tuskless elephants of Africa female? Among Asian elephants, a related species, many males are tuskless, and recent studies suggest they fare surprisingly well on the sexual battlefield when pitted against tusked rivals. Dr. Campbell-Staton is also looking at downstream effects of tusklessness.